Jungle Animal 4pc set. Made of unfinished sustainably harvested USA maple wood. Laser details, smooth finish. No paints or finish coatings. 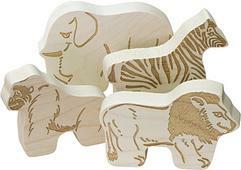 Set contains a lion, gorilla, zebra, and elephant. 2.5" to 3.5" tall. Imaginative play. Wood Care. (LOW STOCK). Made in the USA.